Thermal processing of wastewater sludge includes thermal conditioning, thermal drying, and incineration. Thermal conditioning is the process of applying heat and pressure to sludge to release bound water from solids, thereby enhancing its dewaterability without the addition of conditioning chemicals. This process is described in Chapter 3. Dry lime stabilization of sludge, which is a pasteurization process by virtue of the exothermic reaction of quicklime and sludge, is described in Chapter 6. In this chapter we describe both thermal drying, which is the process of evaporating water from sludge by thermal means, and incineration, which is total destruction of the organic solids in sludge by thermal means. Increasingly strict regulations governing disposal and decreasing availability of disposal sites have renewed interest in thermal drying and incineration as a means of producing a marketable product (thermally dried biosolids) and reducing sludge volume. 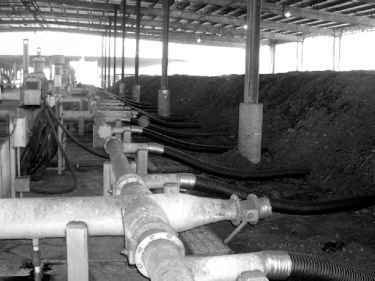 Economic and environmental analyses provide the best basis for deciding whether to use these methods of sludge processing. Although no treatment plant has produced a net profit from thermal drying and the sale of biosolids, several of these operations have been considered successful because the revenues from the sale of biosolids reduce the net processing costs.